Young@Heart’s Norm Moreau, Rosalie Moreau, Anita Shumway and Byron Ricketts Jr. talk shop with Jesus Pagan. Photo by Lynne Graves. On October 21st, we present our 6th annual Mashup Concert. 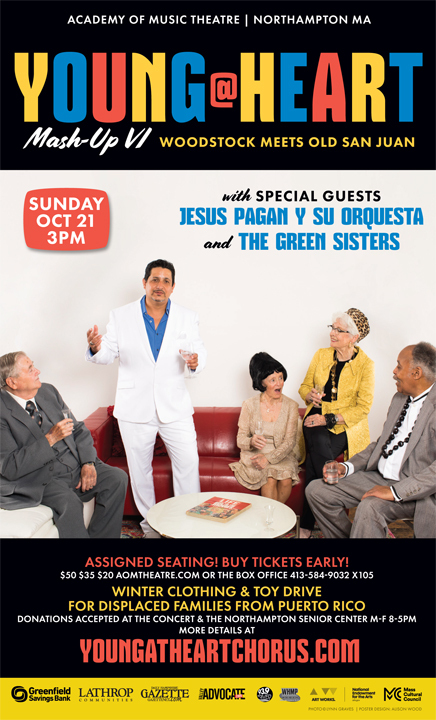 Young@Heart will be joined on-stage by special guests Jesus Pagan Y Su Orquesta, and the Green Sisters. From Woodstock to Old San Juan this Mashup will have you dancing in the aisles! That afternoon we will also hold a Cold-weather Clothing/Toy Drive to benefit displaced families from Puerto Rico and elsewhere (more info here). In preparation for the 50th anniversary of Woodstock (2019), Young@Heart will do an opening set of music from the iconic Woodstock album, but set in a very different context from hippies in the Catskills. This year Young@Heart is honored to share the stage with Jesus Pagan Y Su Orquesta, a fabulous 12-piece salsa band of all-star Latin musicians from Puerto Rico, New York, and New England, who will perform a second set of all original material. Jesus, some of his musicians, and the Green Sisters will join in on Young@Heart's take of Woodstock while Young@Heart will accompany Jesus and his orchestra on a few of their tunes in the second set. The orchestra's leader and vocalist, Jesus Pagan, was born in New York City to Puerto Rican parents. He grew up in a musical family playing aquinaldos, bomba, plenas, boleros and his first love -- salsa. He has since shared the stage with such Latin music legends as Cheo Feliciano, Gilberto Santa Rosa, Larry Harlow, and Tito Nieves, among others. He’s released 5 albums, received accolades at the Grammys and Latin Grammys, numerous Artist-of-the-Year awards and was the Grand Marshall of the Puerto Rican parade in Holyoke in 2016. Some of his greatest musical moments include singing with salsa superstar Gilberto Santa Rosa at a sold-out Carnegie Hall in 2013 and singing lead with Orquesta Dicupe at the Macarena Arena in Medellin, Colombia in front of 20,000 salsa fans. Sprouting from a small farm in rural Massachusetts, The Green Sisters have garnered quite a following over the past three years. With their tight harmonies and high energy tunes, they bounce their jovial banter around the stage as only siblings can. Their debut album Endless Blue was released in June 2018. Valley Advocate called it "a familial gem" while Greenfield Recorder wrote: "As soon as the disc opens...we are already won over; instantly captivated by the sisters' gorgeous vocals." The four gals jump easily from bluegrass to barbershop to blues to Celtic to originals of all styles. As an arts organization, Young@Heart wants to do more than provide entertainment. We are committed to improving and enriching the lives of our community’s most vulnerable members. The one-year anniversary of Hurricane Maria’s devastation of Puerto Rico just passed. We are constantly reminded of how dire the situation in Puerto Rico has been and continues to be, and we are aware that the Pioneer Valley is a major destination for recently displaced families from the island. For example, Springfield enrolled 590 new students within four months of the hurricane, according to Superintendant of Schools Lydia Martinez. In concert with community partners, Young@Heart will be collecting donated cold-weather jackets, gloves, hats, scarves, and kids toys from our fans for these families at our Mashup Concert on October 21st at the Academy of Music Theatre in Northampton. Donations can also be dropped off between now and Oct 21 at the Northampton Senior Center at 67 Conz St in Northampton between 8-5pm Mon-Fri and at Greenfield Savings Bank's Northampton King St, Hadley Rt 9, and Amherst University Drive branches. Greenfield Savings Bank, Lathrop Communities, Daily Hampshire Gazette, Valley Advocate, 93.9 The River, WHMP, National Endowment for the Arts, and the Massachusetts Cultural Council.